Celebrating its 10th birthday, A. Lange & Söhne’s mechanical “digital” watch receives an update for SIHH 2019. The latest Zeitwerk Date delivers the same high precision jumping digital display with an all-new feature – an additional date complication via a sapphire ring date displaying the current date in red. The new A. Lange & Söhne Zeitwerk Date is equipped with a new manufacture calibre, adding a date complication variant of the Zeitwerk series of Handwerkskunst, Minute Repeater, and the Decimal Strike. The Zeitwerk series debuted in 2009, ushering a new era in timekeeping- a digital watch with a mechanical heart. Inspired by the famed Dresden clock (and not an ironic watchmaking exercise mimicking digital quartz devices which almost killed the industry), the Lange Zeitwerk became known for its innovative, precisely jumping digital hours and minutes. 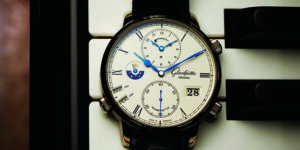 Arguably a foundational pillar for the Saxony manufacture’s know-how, alongside the Datograph collection, the innovative concept of a digital mechanical wristwatch, with constant-force escapement and precisely jumping digital displays indicating hours and minutes with jumping numerals, became a revolutionary icon for the resurgent brand. Ten years later, the A. Lange & Söhne Zeitwerk Date uses the new Lange manufacture calibre L043.8, introducing the series’ first date complication. The 44.2 mm white- gold Zeitwerk Date with a grey dial could be mistaken for a regular Zeitwerk in the collection save for the circumferential date ring consists of glass with printed numerals from 1 to 31 with the current date indicated in red, as a result, the ring-shaped date complication is perfectly harmonised with the Lange Zeitwerk’s overall design codes. To achieve the post-modern date display, a small colour segment beneath the date ring performs one step exactly at midnight. Advancing 31 days, the red section would have complated one full orbital association. Hence, the date is always clearly legible at all times and also recognisable intuitively. The date is itself manually adjusted with a corrector at 8 o’clock which operates on what Tony de Haas calls, “the inverted pusher”. Typically, a user subjects the movement of his watch to an inordinate amount of pressure when using his pushers, this action could technically damage the user’s calibre. However, the switching impulse generated by the Zeitwerk Date when it is released takes a lot of the guesswork and potential for damage out of the equation. Inclusion of the new date display unexpectedly threw up some inconvenient challenges like how the aesthetic codes of a Zeitwerk do not allow for easy layout for the brand’s signature outsized date. Hence, the team eventually decided that they needed a totally new design approach with a precisely jumping ring date. Since time setting accurate to 24 hours would take too long to adjust via the crown of a Zeitwerk due to the minute by minute advancement, the SIHH 2019 Lange Zeitwerk Date incorporates an additional button at 4 o’clock allowing for advance of the hour indication separately. The integration of the hour button was associated with considerable design modifications. To enable the correction independently of the switching cycles of the movement, a clutch uncouples the hour ring from the jumping numerals mechanism each time the button is pressed – Lange Technical Director de Haas refers to this convent as the “inverted” pusher. The 516 piece manually wound calibre L043.8 stands out with its clearly organised movement architecture. What remains is the patented constant-force escapement that handles two tasks. As a remontoir device, it powers the balance of the Zeitwerk Date with a uniform amount of force for the entire running duration. Additionally, it also delivers the one-per-minute impulse for switching the three-disc jumping numerals display.